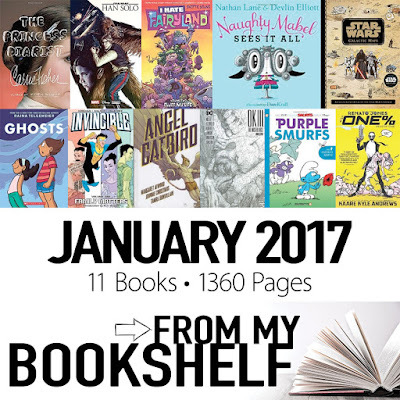 I can tell that this is going to be the year of the graphic novel for me, given that of the 11 books I read in January, 9 of those are graphic novels and 1 is a children's picture book. I don't actually have a problem with this right now. With everything going on in my life, I'm reading what I want and I have no guilt about it whatsoever. Top book for the month by far is Carrie Fisher's The Princess Diarist, chronically her time during the filming of the first Star Wars movie. It was bittersweet reading, with her passing just a couple of days before I read the book; I thought it would be good timing for me, but it actually just made me all the more sad for her passing. The biggest disappointment for me was Margaret Atwood's Angel Catbird, her first foray into graphic novels. Weighed down by terrible puns and overused super hero tropes, I'm truly surprised that a writer of her caliber would produce something so lackluster and forgettable.